It wasn't the most auspicious of debuts. Bon Jovi's first hit single sneaked into the very bottom of the top 50 after months floundering in the lower reaches of the top 100. The song wouldn't even crack the ARIA top 30, but things changed quickly. Within months, the New Jersey hair metal band had become the most popular group in the country. This week in 1987, the most popular song in the country was "Walk Like An Egyptian" by The Bangles, which swapped places with Kim Wilde's "You Keep Me Hangin' On" to spend a second week on top. Their version of "Bad Moon Rising" had done so well that The Reels delved back to the same era, but their take on Edison Lighthouse's debut single was neither as good nor as successful. This first chart hit for the blues singer/guitarist seems to have been his first release credited (at least on the single cover) to him alone and not The Robert Cray Band. Accompanying album Strong Persauder went top 10. It'd started life as a Bonnie Tyler song, re-written by Desmond Child with Bon Jovi members Jon Bon Jovi and Richie Sambora for inclusion on their third album, Slippery When Wet. Released as the first single in the US, it had turned the band from just another rock act to chart-topping stars, but in Australia, "You Give Love A Bad Name" looked like it was going to be a flop. Debuting on the top 100 in November, it peaked at number 55 just before Christmas before dropping all the way back to number 90. 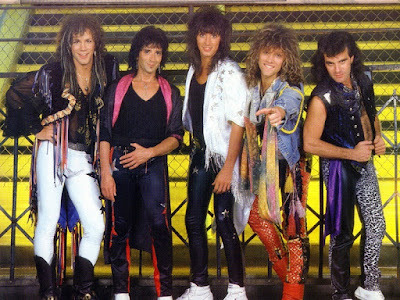 But then, the album's second single was released and "You Give Love A Bad Name" started moving back up the chart as "Livin' On A Prayer" also began to work its way up the top 100. In the end, "You Give Love..." would end up being eclipsed by "Livin' On A Prayer", but for a few weeks, it was the bigger of the two songs. Together with Europe's "The Final Countdown", its success prompted a surge in popularity for hard rock and heavy metal music that would continue for the next few years. The reason why Bon Jovi succeeded in Australia where Mötley Crüe and Def Leppard had not yet been able to is because "You Give Love A Bad Name" is also a great pop song. From its opening seconds, in which Jon sings the chorus hook unaccompanied before the band kicks in, to the "whoh-oh, oh-oo-oh-oh-oh" backing vocals during the fade out, everything about the song is catchy and incredibly accessible, even to a non-rock fan like me. The band had Desmond to thank for that, with the songwriter behind Kiss's "I Was Made For Lovin' You" brought in to help the band write the big choruses they needed to take their music to the next level. Teamed with a live performance video that MTV lapped up, "You Give Love A Bad Name" put the band on the world stage - somewhere they've remained ever since. "You Can Call Me Al" had been one of the biggest hits of the summer, but then so had the Graceland album, so it's not that surprising this follow-up didn't perform so well on the singles chart. 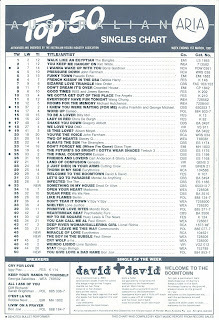 Following the UK's lead, Australia went with "The Boy In The Bubble" as second single instead of "Graceland", although the title track wasn't far behind, entering the top 100 the following week thanks to a pretty rapid release schedule. "The Boy In The Bubble" was the first song Paul had worked on during his visit to South Africa in 1985. He produced the music with a group called Tau Ea Matsekha then wrote the lyrics that compare "days of miracle and wonder" to great tragedy back in the US. Eurythmics' hit streak continued as the duo arrived on the chart with the fourth Australian single from Revenge. "The Miracle Of Love" was a bit of a change of pace for Annie and Dave. Although they'd released slower songs before like "Here Comes The Rain Again" and "It's Alright (Baby's Coming Back)", those couldn't really be described as ballads. That's exactly what "The Miracle Of Love" was - a beautiful ballad worlds apart from the noise of earlier single "Missionary Man". 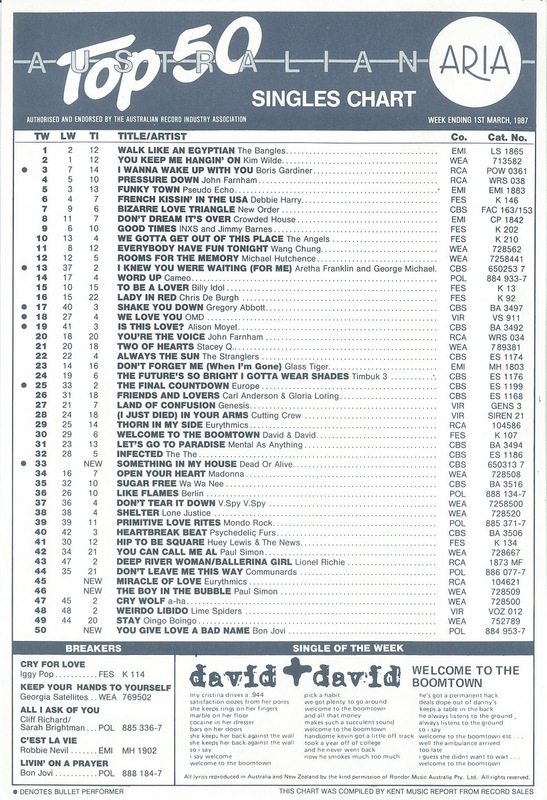 Smack back in the middle of their own hit streak, Dead Or Alive's sixth (out of 11) top 50 singles became their biggest since "Lover Come Back To Me". The spooky song was the second lifted from Mad, Bad And Dangerous To Know, although it, like "Brand New Lover", was significantly longer on the album. Stock Aitken Waterman artists had a rather annoying habit around this time of not including the hit versions of their songs on their albums (see also: Mel & Kim, Princess) - something that was usually more of an American habit. While I've owned the 7" version of "Something On My House" on CD since I picked up a copy of 87 Hits Out during the '90s, there are plenty of songs from the era that are still only readily available in their extended album form and not the shorter single version. Anyway, great song! Next week: an Australian band that would go on to be way more successful in another guise land their biggest hit single. Plus, a song from a brand new musical finally reaches the top 50. I was most surprised to see that 'You Give Love...' missed the top 30 here when I found out (its peak is misprinted as 23 in David Kent’s book); I'd assumed it had been a big hit. What's even more strange is that it became a semi-hit months after being included on the well-selling 'Summer '87' compilation, which is where I would have first heard it. Having not heard the song for some time until a rage airing a few years ago, I listened to it on repeat for the next few days. I'm over it now, but it does have a great chorus. Bananarama even recorded a studio version with Stock Aitken Waterman (yes, it exists). I didn't think I knew the Paul Simon song, but did once the chorus came in. 'The Miracle of Love' is my favourite 'Revenge' single, though overall this was one of their weaker eras. I didn't know 'Something In My House' until a few years ago.